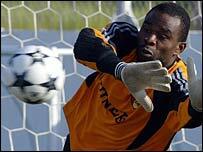 Guinea goalkeeper Kemoko Camara has signed for Dundee United until the end of the season. The 32-year-old featured at the Africa Cup of Nations for his country but was without a club and spent a trial period at Tannadice before agreeing terms. Guinea reached the quarter-finals in Ghana before losing 5-0 to Ivory Coast. United have only youngster Euan McLean as cover for number one Lucasz Zaluska after fellow Pole Grzegorz Szamotulski left to join Championship side Preston.